A highly skilled assassin, Robie is the man the U.S. government calls on to eliminate the worst of the worst—enemies of the state, monsters committed to harming untold numbers of innocent victims. Recently I reviewed, “The Innocent” by David Baldacci, the first book featuring his newest character, Will Robie. I enjoyed it enough that I immediately decided to pick up the second installment in the series, “The Hit“…and am very glad that I did. While I felt at times that The Innocent had a very linear storyline with a somewhat predictable ending, The Hit was the exact opposite and is a huge improvement over the first story. Don’t get me wrong, The Innocent was a very enjoyable book and I recommended it in my review – especially to those interested in reading The Hit. However, I felt that it would drag on unnecessarily during certain chapters, in addition to the relationships not being particularly endearing or fleshed out in a way that allows the reader to become more emotionally invested in them. 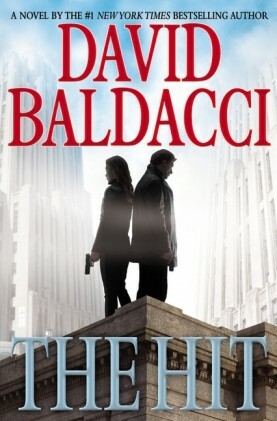 The Hit is a far more complex, interesting and enjoyable story, in which Baldacci takes the reader inside the minds of many of the central characters, while never giving away anything that points toward an obvious or predictable conclusion. Although my suspicions were confirmed as to where the book was headed and who was involved, the trip getting there was very satisfying, as I was never truly 100% certain until I reached the end. In The Hit, Will Robie learns that an equally skilled assassin by the name of Jessica Reel has gone “rogue” and is killing members of the CIA, the agency that trained and employs them both. As a result, Robie is assigned to track her down and bring her in, dead or alive. Seemingly unconnected at first, Reel’s initial targets range from a lowly agency handler to the Deputy Director of the CIA, with the promise that more deaths will follow. As the story unravels we begin to learn of a larger and more ominous conspiracy, one with terrifying global implications. Because we are given insight into Reel’s character through early chapters that feature her inner monologue and thoughts, I don’t believe that Baldacci ever expected the reader to view Reel as the “bad guy,” but rather as part of a larger conspiracy that Robie has to unfold, in order to understand her motivation behind the killings. Reel is also always a step ahead of Robie, and what follows is a compelling and exciting game of cat and mouse that leaves the reader rapidly turning the pages and trying to figure out what Reel is really up to and how Robie is going to catch up to her…and what he’ll do when he does. The end of the novel makes it possible for Baldacci to close the book on Will Robie forever, but also leaves some wide avenues open to tie off loose ends and to do something interesting in future books, should there be any…the latter I prefer to happen and predict to be true. I thoroughly enjoyed this book and am confident that fans of espionage novels will also agree. The fact that the story takes place in Washington D.C. (where I live), only added to my enjoyment, coupled with the rapidly moving story and converging characters. Compared to The Innocent, the characters in The Hit are simply more rich, the story is more compelling and the pace is more rapid and satisfying. However, I still recommend reading The Innocent first, if only for the important context and exposition required for some of the references and characters in The Hit.